As you can see here, ensembleing dapper doesn't take that much time. 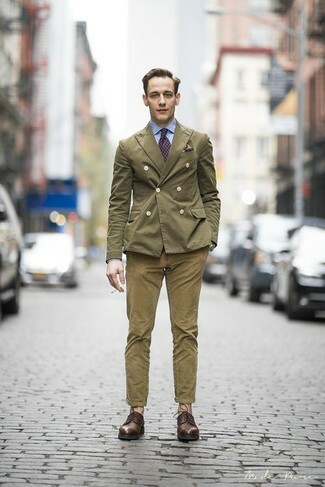 Just go for an olive double breasted blazer and olive chinos and you'll look incredibly stylish. When it comes to shoes, this ensemble pairs wonderfully with Vince Camuto Samtin Plain Toe Blucher. 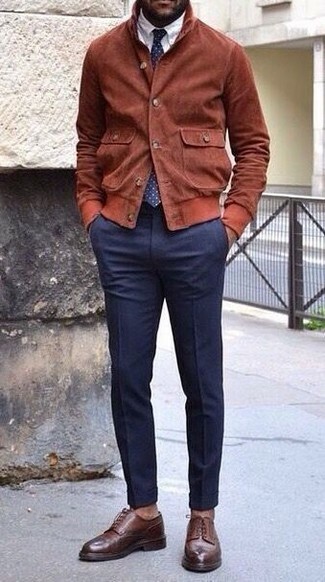 Wear a tobacco suede bomber jacket and navy dress pants like a true gent. 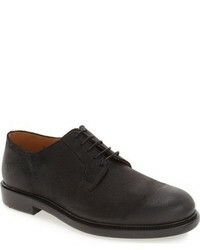 Vince Camuto Samtin Plain Toe Blucher from Nordstrom are a great choice to complete the look. Something as simple as opting for an olive suit and a multi colored check dress shirt can potentially set you apart from the crowd. For something more on the daring side to finish off this getup, choose a pair of Vince Camuto Samtin Plain Toe Blucher. For a nothing less than incredibly stylish outfit, pair a charcoal suit with a white dress shirt. For something more on the daring side to complement this ensemble, make dark brown leather derby shoes your footwear choice. If you're a fan of comfort dressing when it comes to your personal style, you'll love this simple pairing of a white and navy cardigan and navy ripped jeans. 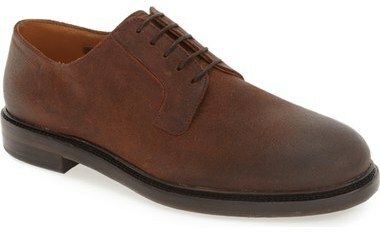 Make Vince Camuto dark brown leather derby shoes your footwear choice to show your sartorial savvy. 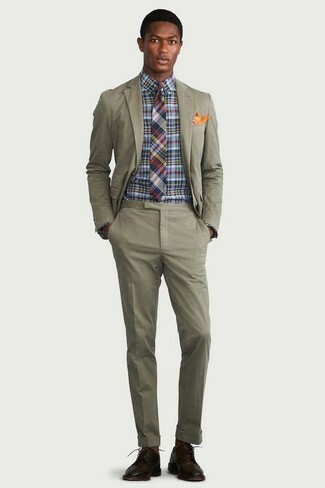 For a smart casual outfit, wear a tobacco check blazer and white chinos — these items go pretty good together. 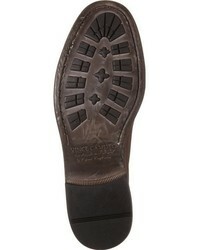 Up the cool of your outfit by wearing Vince Camuto Samtin Plain Toe Blucher from Nordstrom. 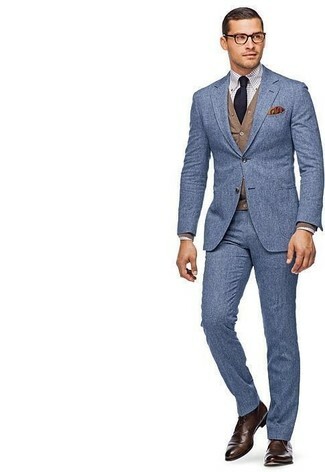 Wear a blue wool suit with a brown cardigan for incredibly stylish attire. Throw in a pair of dark brown leather derby shoes for a more relaxed feel. 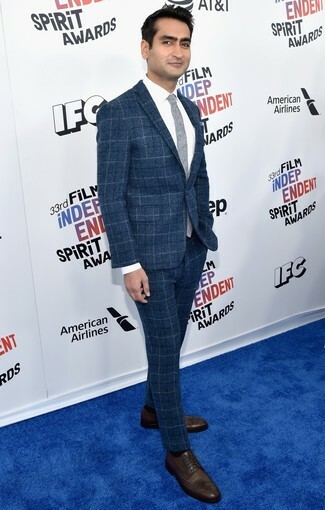 Hard proof that a blue check wool suit and a white dress shirt look awesome together in a sophisticated outfit for a modern gentleman. In the shoe department, go for something on the casual end of the spectrum by finishing with a pair of Vince Camuto dark brown leather derby shoes. 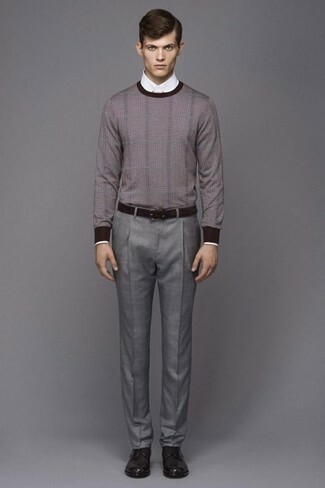 Pair a grey crew-neck sweater with grey dress pants for a classic and refined silhouette. When it comes to footwear, this look is round off wonderfully with Vince Camuto dark brown leather derby shoes.